"Lord Tennyson" redirects here. For other Lords Tennyson, see Baron Tennyson. "Tennyson" redirects here. For other people and places named Tennyson, see Tennyson (disambiguation). Alfred Tennyson, 1st Baron Tennyson FRS (6 August 1809 – 6 October 1892) was a British poet. He was the Poet Laureate of Great Britain and Ireland during much of Queen Victoria's reign and remains one of the most popular British poets. In 1829, Tennyson was awarded the Chancellor's Gold Medal at Cambridge for one of his first pieces, "Timbuktu". He published his first solo collection of poems, Poems Chiefly Lyrical in 1830. "Claribel" and "Mariana", which remain some of Tennyson's most celebrated poems, were included in this volume. Although decried by some critics as overly sentimental, his verse soon proved popular and brought Tennyson to the attention of well-known writers of the day, including Samuel Taylor Coleridge. Tennyson's early poetry, with its medievalism and powerful visual imagery, was a major influence on the Pre-Raphaelite Brotherhood. Tennyson also excelled at penning short lyrics, such as "Break, Break, Break", "The Charge of the Light Brigade", "Tears, Idle Tears", and "Crossing the Bar". Much of his verse was based on classical mythological themes, such as "Ulysses", although "In Memoriam A.H.H." was written to commemorate his friend Arthur Hallam, a fellow poet and student at Trinity College, Cambridge, after he died of a stroke at the age of 22. Tennyson also wrote some notable blank verse including Idylls of the King, "Ulysses", and "Tithonus". During his career, Tennyson attempted drama, but his plays enjoyed little success. A number of phrases from Tennyson's work have become commonplaces of the English language, including "Nature, red in tooth and claw" (In Memoriam A.H.H. ), "'Tis better to have loved and lost / Than never to have loved at all", "Theirs not to reason why, / Theirs but to do and die", "My strength is as the strength of ten, / Because my heart is pure", "To strive, to seek, to find, and not to yield", "Knowledge comes, but Wisdom lingers", and "The old order changeth, yielding place to new". He is the ninth most frequently quoted writer in The Oxford Dictionary of Quotations. Tennyson was born on 6 August 1809 in Somersby, Lincolnshire, England. He was born into a middle-class family distantly descended from John Savage, 2nd Earl Rivers. His father, George Clayton Tennyson (1778–1831), was rector of Somersby (1807–1831), also rector of Benniworth (1802–1831) and Bag Enderby, and vicar of Grimsby (1815). Rev. George Clayton Tennyson raised a large family and "was a man of superior abilities and varied attainments, who tried his hand with fair success in architecture, painting, music, and poetry. He was comfortably well off for a country clergyman and his shrewd money management enabled the family to spend summers at Mablethorpe and Skegness on the eastern coast of England". Alfred Tennyson's mother, Elizabeth Fytche (1781–1865), was the daughter of Stephen Fytche (1734–1799), vicar of St. James Church, Louth (1764) and rector of Withcall (1780), a small village between Horncastle and Louth. Tennyson's father "carefully attended to the education and training of his children". Tennyson and two of his elder brothers were writing poetry in their teens and a collection of poems by all three was published locally when Alfred was only 17. One of those brothers, Charles Tennyson Turner, later married Louisa Sellwood, the younger sister of Alfred's future wife; the other was Frederick Tennyson. Another of Tennyson's brothers, Edward Tennyson, was institutionalised at a private asylum. Tennyson was a student of King Edward VI Grammar School, Louth from 1816 to 1820. He entered Trinity College, Cambridge, in 1827, where he joined a secret society called the Cambridge Apostles. A portrait of Tennyson by George Frederic Watts is in Trinity's collection. At Cambridge, Tennyson met Arthur Hallam and William Henry Brookfield, who became his closest friends. His first publication was a collection of "his boyish rhymes and those of his elder brother Charles" entitled Poems by Two Brothers, published in 1827. In 1829, Tennyson was awarded the Chancellor's Gold Medal at Cambridge for one of his first pieces, "Timbuktu". Reportedly, "it was thought to be no slight honour for a young man of twenty to win the chancellor's gold medal". He published his first solo collection of poems, Poems Chiefly Lyrical in 1830. "Claribel" and "Mariana", which later took their place among Tennyson's most celebrated poems, were included in this volume. Although decried by some critics as overly sentimental, his verse soon proved popular and brought Tennyson to the attention of well-known writers of the day, including Samuel Taylor Coleridge. In the spring of 1831, Tennyson's father died, requiring him to leave Cambridge before taking his degree. He returned to the rectory, where he was permitted to live for another six years and shared responsibility for his widowed mother and the family. Arthur Hallam came to stay with his family during the summer and became engaged to Tennyson's sister, Emilia Tennyson. In 1833 Tennyson published his second book of poetry, which notably included the first version of The Lady of Shalott. The volume met heavy criticism, which so discouraged Tennyson that he did not publish again for ten years, although he did continue to write. That same year, Hallam died suddenly and unexpectedly after suffering a cerebral haemorrhage while on a holiday in Vienna. Hallam's death had a profound effect on Tennyson and inspired several poems, including "In the Valley of Cauteretz" and In Memoriam A.H.H., a long poem detailing the "Way of the Soul". Tennyson and his family were allowed to stay in the rectory for some time, but later moved to Beech Hill Park, High Beach, deep within Epping Forest, Essex, about 1837. Tennyson’s son recalled: “there was a pond in the park on which in winter my father might be seen skating, sailing about on the ice in his long blue cloak. He liked the nearness of London, whither he resorted to see his friends, but he could not stay in town even for a night, his mother being in such a nervous state that he did not like to leave her...". Tennyson befriended a Dr Allen, who ran a nearby asylum whose patients then included the poet John Clare. An unwise investment in Dr Allen's ecclesiastical wood-carving enterprise soon led to the loss of much of the family fortune, and led to a bout of serious depression. Tennyson moved to London in 1840 and lived for a time at Chapel House, Twickenham. In 1842, while living modestly in London, Tennyson published the two volume Poems, of which the first included works already published and the second was made up almost entirely of new poems. They met with immediate success; poems from this collection, such as Locksley Hall, "Break, Break, Break", and Ulysses, and a new version of The Lady of Shalott, have met enduring fame. The Princess: A Medley, a satire on women's education that came out in 1847, was also popular for its lyrics. W. S. Gilbert later adapted and parodied the piece twice: in The Princess (1870) and in Princess Ida (1884). It was in 1850 that Tennyson reached the pinnacle of his career, finally publishing his masterpiece, In Memoriam A.H.H., dedicated to Hallam. Later the same year, he was appointed Poet Laureate, succeeding William Wordsworth. 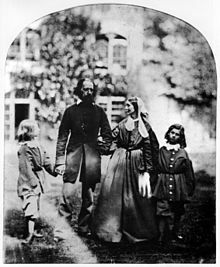 In the same year (on 13 June), Tennyson married Emily Sellwood, whom he had known since childhood, in the village of Shiplake. They had two sons, Hallam Tennyson (b. 11 August 1852)—named after his friend—and Lionel (b. 16 March 1854). Tennyson rented Farringford House on the Isle of Wight in 1853, eventually buying it in 1856. 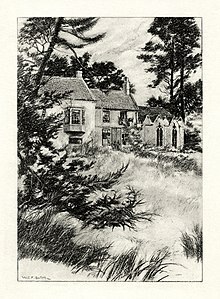 He eventually found that there were too many starstruck tourists who pestered him in Farringford, so he moved to Aldworth, in West Sussex in 1869. However, he retained Farringford, and regularly returned there to spend the winters. In 1850, after William Wordsworth's death and Samuel Rogers' refusal, Tennyson was appointed to the position of Poet Laureate; Elizabeth Barrett Browning and Leigh Hunt had also been considered. He held the position until his own death in 1892, the longest tenure of any laureate. Tennyson fulfilled the requirements of this position by turning out appropriate but often uninspired verse, such as a poem of greeting to Princess Alexandra of Denmark when she arrived in Britain to marry the future King Edward VII. In 1855, Tennyson produced one of his best-known works, "The Charge of the Light Brigade", a dramatic tribute to the British cavalrymen involved in an ill-advised charge on 25 October 1854, during the Crimean War. Other esteemed works written in the post of Poet Laureate include "Ode on the Death of the Duke of Wellington" and "Ode Sung at the Opening of the International Exhibition". Tennyson initially declined a baronetcy in 1865 and 1868 (when tendered by Disraeli), finally accepting a peerage in 1883 at Gladstone's earnest solicitation. In 1884 Victoria created him Baron Tennyson, of Aldworth in the County of Sussex and of Freshwater in the Isle of Wight. He took his seat in the House of Lords on 11 March 1884. 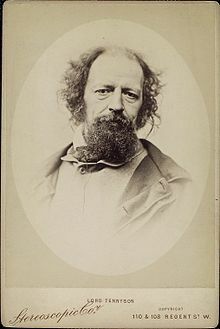 Tennyson also wrote a substantial quantity of unofficial political verse, from the bellicose "Form, Riflemen, Form", on the French crisis of 1859 and the Creation of the Volunteer Force, to "Steersman, be not precipitate in thine act/of steering", deploring Gladstone's Home Rule Bill. Tennyson's family were Whigs by tradition and Tennyson's own politics fit the Whig mold, although he would also vote for the Liberal Party after the Whigs dissolved. 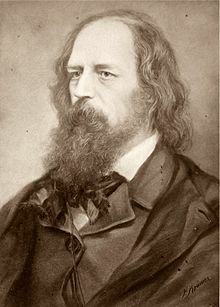 Tennyson believed that society should progress through gradual and steady reform, not revolution, and this attitude was reflected in his attitude toward universal suffrage, which he did not outright reject, but recommended only after the masses had been properly educated and adjusted to self-government. Upon passage of the 1832 Reform Act, Tennyson broke into a local church to ring the bells in celebration. Virginia Woolf wrote a play called Freshwater, showing Tennyson as host to his friends Julia Margaret Cameron and G.F. Watts. Tennyson was the first to be raised to a British peerage for his writing. A passionate man with some peculiarities of nature, he was never particularly comfortable as a peer, and it is widely held that he took the peerage in order to secure a future for his son Hallam. Colonel George Edward Gouraud, Thomas Edison's European agent, made sound recordings of Tennyson reading his own poetry, late in his life. They include recordings of "The Charge of the Light Brigade", and excerpts from "The splendour falls" (from The Princess), "Come into the garden" (from Maud), "Ask me no more", "Ode on the death of the Duke of Wellington" and "Lancelot and Elaine". The sound quality is poor, as wax cylinder recordings usually are. 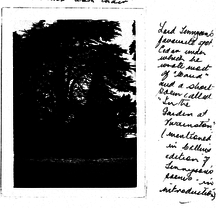 Photograph of the cedar tree at Swainston Manor, Isle of Wight. In the late 1890s, Lady Simeon at Swainston told her nurse that Tennyson wrote "Maud" under this tree. Note the similarities in setting between this photo and the arbor above. Photos of the Gardens at Swainston under the wiki entry for Swainston Manor. 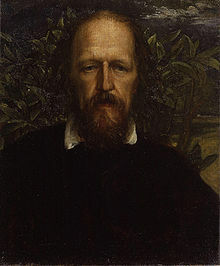 Towards the end of his life Tennyson revealed that his "religious beliefs also defied convention, leaning towards agnosticism and pandeism": In a characteristically Victorian manner, Tennyson combines a deep interest in contemporary science with an unorthodox, even idiosyncratic, Christian belief. Famously, he wrote in In Memoriam: "There lives more faith in honest doubt, believe me, than in half the creeds." In Maud, 1855, he wrote: "The churches have killed their Christ". In "Locksley Hall Sixty Years After," Tennyson wrote: "Christian love among the churches look'd the twin of heathen hate." In his play, Becket, he wrote: "We are self-uncertain creatures, and we may, Yea, even when we know not, mix our spites and private hates with our defence of Heaven". Tennyson recorded in his Diary (p. 127): "I believe in Pantheism of a sort". His son's biography confirms that Tennyson was an unorthodox Christian, noting that Tennyson praised Giordano Bruno and Spinoza on his deathbed, saying of Bruno, "His view of God is in some ways mine", in 1892. Tennyson continued writing into his eighties. He died on 6 October 1892 at Aldworth, aged 83. He was buried at Westminster Abbey. A memorial was erected in All Saints' Church, Freshwater. His last words were, "Oh that press will have me now!". He left an estate of £57,206. 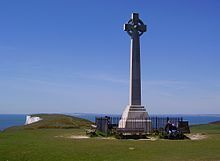 Tennyson Down and the Tennyson Trail on the Isle of Wight are named after him, and a monument to him stands on top of Tennyson Down. Lake Tennyson in New Zealand's high country, named by Frederick Weld, is assumed to be named after Lord Tennyson. He was succeeded as 2nd Baron Tennyson by his son, Hallam, who produced an authorised biography of his father in 1897, and was later the second Governor-General of Australia. Although Prince Albert was largely responsible for Tennyson's appointment as Laureate, Queen Victoria became an ardent admirer of Tennyson's work, writing in her diary that she was "much soothed & pleased" by reading "In Memoriam A.H.H." after Albert's death. The two met twice, first in April 1862, when Victoria wrote in her diary, "very peculiar looking, tall, dark, with a fine head, long black flowing hair & a beard, oddly dressed, but there is no affectation about him." Tennyson met her a second time just over two decades later, on 7 August 1883, and the Queen told him what a comfort "In Memoriam A.H.H." had been. Tennyson was a craftsman who polished and revised his manuscripts extensively, to the point where his efforts at self-editing were described by his contemporary Robert Browning as "insane", symptomatic of "mental infirmity". His complex compositional practice and frequent redrafting also demonstrates a dynamic relationship between images and text, as can be seen in the many notebooks he worked in. Few poets have used such a variety of styles with such an exact understanding of metre; like many Victorian poets, he experimented in adapting the quantitative metres of Greek and Latin poetry to English. He reflects the Victorian period of his maturity in his feeling for order and his tendency towards moralising. 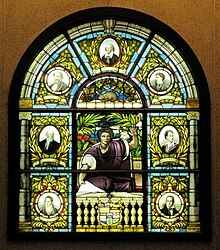 He also reflects a concern common among Victorian writers in being troubled by the conflict between religious faith and expanding scientific knowledge. Tennyson possessed a strong poetic power, which his early readers often attributed to his "Englishness" and his masculinity. Well known among his longer works are Maud and Idylls of the King, the latter arguably the most famous Victorian adaptation of the legend of King Arthur and the Knights of the Round Table. A common thread of grief, melancholy, and loss connects much of his poetry (including Mariana, The Lotos Eaters, Tears, Idle Tears, In Memoriam), possibly reflecting Tennyson's own lifelong struggle with debilitating depression. T. S. Eliot famously described Tennyson as "the saddest of all English poets", whose technical mastery of verse and language provided a "surface" to his poetry's "depths, to the abyss of sorrow". Other poets such as W. H. Auden maintained a more critical stance, stating that Tennyson was the "stupidest" of all the English poets, adding that: "There was little about melancholia he didn't know; there was little else that he did." Tennyson's early poetry, with its medievalism and powerful visual imagery, was a major influence on the Pre-Raphaelite Brotherhood. In 1848, Dante Gabriel Rossetti and William Holman Hunt made a list of "Immortals", artistic heroes whom they admired, especially from literature, notably including Keats and Tennyson, whose work would form subjects for PRB paintings. 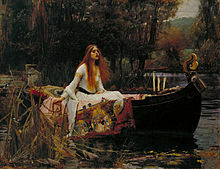 The Lady of Shalott alone was a subject for Rossetti, Hunt, John William Waterhouse (three versions), and Elizabeth Siddall. An heraldic achievement of Alfred, Lord Tennyson exists in an 1884 stained-glass window in the Hall of Trinity College, Cambridge, showing arms: Gules, a bend nebuly or thereon a chaplet vert between three leopard's faces jessant-de-lys of the second; Crest: A dexter arm in armour the hand in a gauntlet or grasping a broken tilting spear enfiled with a garland of laurel; Supporters: Two leopards rampant guardant gules semée de lys and ducally crowned or; Motto: Respiciens Prospiciens ("Looking backwards (is) looking forwards"). 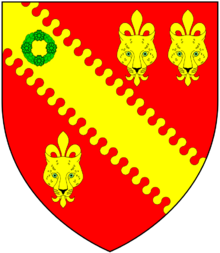 These are a difference of the arms of Thomas Tenison (1636–1715), Archbishop of Canterbury, themselves a difference of the arms of the 13th-century Denys family of Glamorgan and Siston in Gloucestershire, themselves a difference of the arms of Thomas de Cantilupe (c. 1218–1282), Bishop of Hereford, henceforth the arms of the See of Hereford; the name "Tennyson" signifies "Denys's son", although no connection between the two families is recorded. 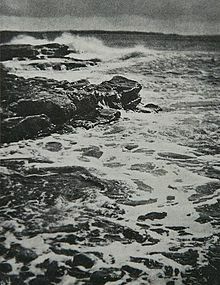 Break, Break, Break, on thy cold gray Stones, o Sea, a photograph by Rudolf Eickemeyer Jr. The title is a quote from the 1842 poem. ^ "British Listed Buildings – Aldworth House, Lurgashall". British Listed Buildings Online. Retrieved 5 November 2012. ^ Stern, Keith (2007). Queers In History (2007 ed.). Quistory Publishers. ^ The Oxford Dictionary of Quotations (5th ed.). Oxford University Press. 1999. ^ a b c d Poems of Alfred Lord Tennyson. Eugene Parsons (Introduction). New York: Thomas Y. Crowell Company, 1900. ^ "Tennyson, Alfred (TNY827A)". A Cambridge Alumni Database. University of Cambridge. ^ "Trinity College, University of Cambridge". BBC Your Paintings. Archived from the original on 11 May 2014. Retrieved 12 February 2018. ^ Friedlander, Ed. "Enjoying "Timbuktu" by Alfred Tennyson"
^ "Lincolnshire People – Famous Yellowbellies – Alfred, Lord Tennyson". BBC. 31 August 2005. Archived from the original on 31 August 2005. Retrieved 26 March 2018. ^ a b c H. Tennyson (1897). Alfred Lord Tennyson: A Memoir by His Son, New York: MacMillan. ^ Good Stuff. "Aldworth House – Lurgashall – West Sussex – England – British Listed Buildings". britishlistedbuildings.co.uk. ^ a b Batchelor, John. Tennyson: To Strive, To Seek, To Find. London: Chatto and Windus, 2012. ^ "No. 25308". The London Gazette. 15 January 1884. p. 243. ^ a b c Pearsall, Cornelia D.J. (2008). Tennyson's Rapture: Transformation in the Victorian Dramatic Monologue. Oxford University Press. pp. 38–44. ^ Ormond, Leonee (1993). Alfred Tennyson: A Literary Life. Springer. p. 146. ^ "primaveraproductions.com". primaveraproductions.com. Archived from the original on 23 September 2015. 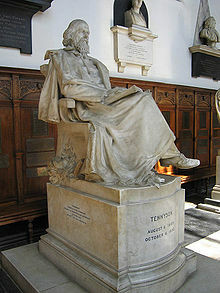 ^ "Tennyson, Science and Religion". www.victorianweb.org. ^ Reed, A.W. (2010). Peter Dowling (ed.). Place Names of New Zealand. Rosedale, North Shore: Raupo. p. 411. ISBN 9780143204107. ^ "Queen Victoria's Journals – Information Site". queenvictoriasjournals.org. 5 January 1862. ^ "Queen Victoria's Journals – Information Site". queenvictoriasjournals.org. 14 April 1862. ^ "Queen Victoria's Journals – Information Site". queenvictoriasjournals.org. 7 August 1883. ^ Grendon, Felix (July 1907). "The Influence of Keats upon the Early Poetry of Tennyson". The Sewanee Review. 15 (3): 285–296. Retrieved 24 October 2014. ^ Baker, John Haydn (2004). Browning and Wordsworth. Cranbury NJ: Fairleigh Dickinson Univ Press. p. 10. ISBN 0838640389. Retrieved 24 October 2014. ^ "Tennyson". cudl.lib.cam.ac.uk. Retrieved 5 October 2017. ^ Pattison, Robert (1979). Tennyson and Tradition. Cambridge: Harvard University Press. p. 106. ISBN 0674874153. Retrieved 24 October 2014. ^ Gossin, Pamela (2002). Encyclopedia of Literature and Science. Westport CT: Greenwood Publishing Group. p. 461. ISBN 0313305382. Retrieved 24 October 2014. ^ Sherwood, Marion (2013). Tennyson and the Fabrication of Englishness. New York: Palgrave Macmillan. pp. 69–70. ISBN 1137288892. Retrieved 6 December 2014. ^ Riede, David G. (2000). "Tennyson's Poetics of Melancholy and the Imperial Imagination". Studies in English Literature. 40 (4): 659–678. doi:10.1353/sel.2000.0040. ^ T. S. Eliot, Selected Prose of T. S. Eliot. Ed. Frank Kermode. New York: Harcourt, 1975. P. 246. ^ "The Pre-Raphaelites". The British Library. ^ The Bitmill Inc. "Nothing Will Die". litscape.com. ^ The Bitmill Inc. "All Things Will Die". litscape.com. ^ "Poetry Lovers' Page: Alfred Lord Tennyson". poetryloverspage.com. ^ "Becket and other plays by Baron Alfred Tennyson Tennyson - Free Ebook". gutenberg.org. Retrieved 20 September 2014. ^ Alfred Lord Tennyson (1899). Hallam Tennyson (ed.). The life and works of Alfred Lord Tennyson. 8. Macmillan. pp. 261–263. Alfred, Lord Tennyson (1989). Tennyson: A Selected Edition. California: University of California Press ISBN 0520065883 (hbk.) or ISBN 0520066669 (pbk.) Edited with a preface and notes by Christopher Ricks. Selections from the definitive edition The Poems of Tennyson, with readings from the Trinity MSS; long works like Maud and In Memoriam A. H. H. are printed in full. Leslie, Stephen (1898). "Life of Tennyson" . Studies of a Biographer. 2. London: Duckworth and Co. pp. 196–240. Recording of Tennyson reciting "The Charge of the Light Brigade"
Anonymous (1873). Cartoon portraits and biographical sketches of men of the day. Illustrated by Frederick Waddy. London: Tinsley Brothers. pp. 78–84. Retrieved 6 January 2011. A substantial collection of Tennyson's works are held at Special Collections and Archives, Cardiff University. The Baron Alfred Tennyson digital collection from the Harry Ransom Center at The University of Texas at Austin. "Now Sleeps the Crimson Petal"